St. Alberta April 12, 2018 Community members gathered at Youville Home in St. Albert to enjoy a VIP Preview of the multipurpose room and greenhouse space project slated for the facility. In the early stages of planning, the event was an opportunity for community leaders to begin helping Covenant Foundation reach its commitment of raising $1 million for the addition. The project will be funded entirely through Covenant Foundation. Mayor Cathy Heron expanded on the need for the project and its value to the community. Covenant Health VP Finance Sheila Smith spoke of the dedication and caring of site staff and volunteers. Site Director Cecilia Marion spoke eloquently about the value of the space to residents and the long-standing service of Youville Home to the community. ONPA Architects' Paul Byrne displayed a rendered walk-through of the space, explaining the goals and influences at play, while inviting further input from the community and residents. 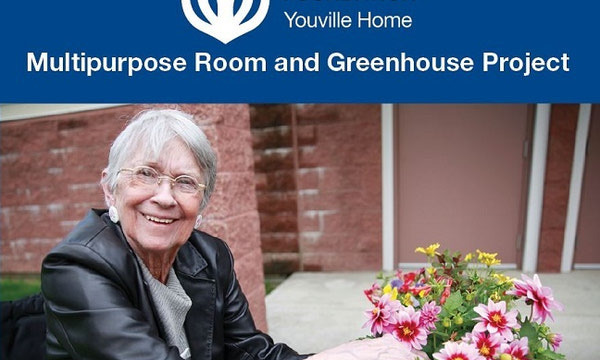 Youville Home Resident Edna Waite spoke about the joy and general good health that was evident when residents had the opportunity to enjoy sunshine and plants, and expressed her gratitude for the hard-working staff and volunteers caring for them in their home. Community members were then invited to interact with speakers in a question and answer period, prior to light refreshments being served. Gathered for the project preview were Mayor Cathy Heron, Councillor Jacquie Hansen, Covenant Health VP Finance Sheila Smith, former Mayor and Covenant Health Board Committee Member Nolan Crouse, Covenant Health Board Committee Member Dale Rokosh, Covenant Foundation CEO Tracy Sopkow, Youville Home Senior Director of Operations Cecilia Marion, Chamber of Commerce President Jennifer McCurdy, Architect Paul Byrne, Covenant Capital Planning team Glen Bosecke and Warren Erickson, as well as many members of the community at large including representatives from community businesses and various service groups. More information on the project is available. If you're interested in contributing to the fundraising effort, Covenant Foundation encourages you to contact Britni Brady, Development Officer at 780-342-8892 or britni.brady@covenanthealth.ca. 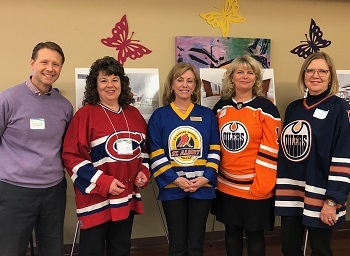 *Picture above (from right to left) are Dr. Darryl LaBuick of Grandin Medical Clinic, Senior Director of Operations for Youville Home Cecilia Marion, St. Albert Councillor Jacquie Hansen, Mayor of St. Albert Cathy Heron, and President & CEO of the St. Albert Chamber of Commerce Jennifer McCurdy. Jerseys are in honour of #jerseysforhumboldt #humboldtstrong.